The metal industry in Indonesia is facing greater risks and challenges locally and globally. Therefore, decision makers in this industry should be able not only to be competitive in the market but also to be resilient in this dynamic environment. The purpose of this study is to assess and analyze the resilience of the metal sector in Indonesia through the Cobb-Douglas Production Function (CDPF). The analysis shows how labor expenses, capital investment, and Total Factor Productivity (TFP) contribute to sector growth. Shock, represented by the drastic changes in both global and local economies reflected in exchange rate shocks in 2008 and 2013, impacts not only sector growth but also the composition of labor expenses, capital investment, and TFP in the sector. 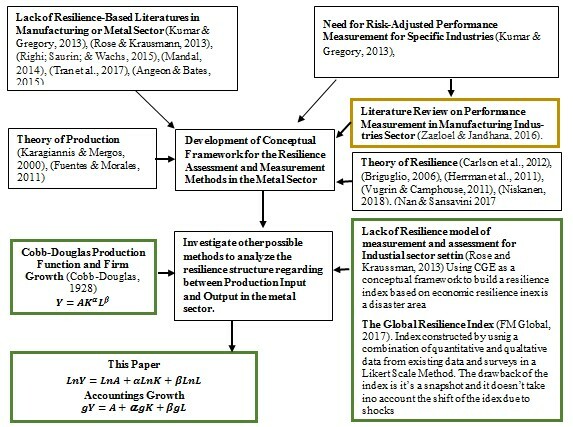 Based on time series data, this study determines that the assessment is able to detect the structure of the sector’s production function, which becomes the building block of sector resilience after experiencing a shock. This study and its findings contribute to studies in resilience measurement in both the metal sector and other industries. The metal sector is currently facing greater challenges not only due to its riskier and more complex operating environment but also due to its very competitive market. To maintain growth in this demanding environment, the sector must be resilient in facing various disruptions that may inhibit sector performance. One of many methods to analyze resilience is through assessing the growth of several variables described in Production Function theories, such as labor expenses, capital investment, and applied technology in production. Although there are other Production Function theories such as Constant Elasticity of Substitutions by Solow (1957) and Leontief Production Function by Leontief (1947), this research limits its investigation to exploring the use of the Cobb-Douglas Production Function (CDPF) by Cobb and Douglas (1928) as described by Baier et al. (2002). Sector resilience is very important to national economies since it contributes to the sustainability of output for national economic growth (Mankiw, 2014). 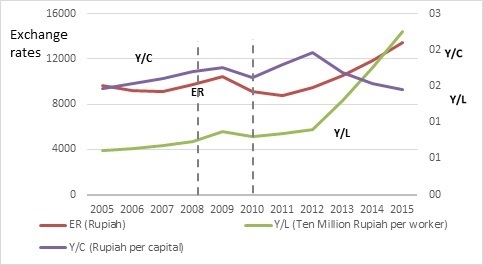 The resilience of the Indonesian metal sector had been tested over the past few decades. This includes a major financial crisis in 1997–1998, a global crisis in 2008, and local currency devaluation in 2013. The impact of these crises shows the weakness of the Indonesian economy and the importance of the industrial sector to the economy. Although there had been an increasing trend of average annual economic growth of 5.1% between 1999–2008 after experiencing the 2008 crisis, the growth of the industrial sector still shows a slowing trend with an average annual growth of 3.9% (Suryahadi et al., 2012). Several studies have implemented resilience concepts in economics over the past few years. For example, Rose and Krausmann (2013), Kumar and Gregory (2013), and Dormady et al. (2018) elaborated on the framework for a resilience analysis of input-output production function at the firm level. These studies focused more on community resilience in disaster zones. Using the same framework as Dormady et al. (2018), this study proposes a different approach using CDPF to analyze and assess resilience at the sector level through its production structure when the sector experiences currency shock during an economic crisis. This paper adds to the previous study in assessing resilience by measuring the efficiency of the metal sector in Indonesia (Jandhana et al., 2017). Efficiency was measured by calculating the input and output of the metal sector and using the Data Envelopment Analysis (DEA) method. Despite its ability to assess industrial resilience through its efficiency value (Jandhana et al., 2017), this study found that DEA has several limitations. First, it is difficult to track the recovery trend in sector performance recovery and to trace the shift in input variables after the sector experiences economic shocks. Second, the input and output variables need to be analyzed prior to calculation so the results reflect the actual condition (Zbranek, 2013). The concept of resilience has been implemented not only in economics fields but also in fields such as social sciences, environmental sciences, and others. Various definitions have been given (Kumar & Gregory, 2013; Righi et al., 2015), but most are related to safety attitudes or responses to risk events such as shocks that impact or cause critical or catastrophic states. Additionally, they are also associated with adapting to new environments and returning to normal or equilibrium states. According to Windle (2011), the word “resilience” comes from the Latin word “resilire,” which means “to leap back,” “to spring back,” or “to recover easily.” Historically, several scholars have been considered pioneers in resilience studies. Holling (1973) introduced the implementation of both resilience and stability concepts to describe the behavior of ecosystems. Resilience was also used by Garmezy (1985) in the field of developmental psychology to describe the stress-resistant abilities of children. In the engineering field, resilience is implemented for safety measures (Woods, 2003). Several studies associated with resilience had been reviewed, such as recovery management after local disasters (Cutter et al., 2010), the ability of a person to regain mental or physical health despite adversity (Herrman et al., 2011), risk and performance management associated with supply chain resilience (Mandal, 2014), various system safety and risk assessment studies (Righi et al., 2015), and the concept development for the infrastructure resilience (Vugrin & Camphouse, 2011). There are two approaches to resilience studies in economics. The first approach is related to economic-based resilience, which describes how a local economy operates efficiently in a new equilibrium state after experiencing a shock by using its available resources. This concept was examined by Rose and Krausmann (2013). The second approach is engineering-based resilience, which was outlined by Bruneau et al. (2003). This engineering-based resilience focuses on investigating the properties of physical or social systems, such as robustness, redundancy, resourcefulness, and rapidity of response. Although the frameworks are helpful in providing guidance for analyzing the resilience characteristics of an object, they are not sufficient to analyze the structure of input-output production functions before and after an economic crisis. Studies that investigate and assess industrial sector resilience through production function are still lacking. As described by Zagloel and Jandhana (2016), most performance-based indices such as the Global Competitive Index (GCI), World Competitiveness Yearbook (WCY), Competitiveness Industrial Performance (CIP), The Global Manufacturing Competitiveness Index (GMCI), and Purchasing Manager Index use Likert scales instead of employing methods that elaborate on the dynamic characteristics of sector resilience. The scale was also adopted to measure economic resilience by Briguglio et al. (2006). Although the Likert scale method has been applied in many performance assessments and measurements, the method may expose the studies to subjectivity by collecting biased answers if the questionnaires are not performed objectively by the surveyors (Hartley, 2013). In another study, Rose and Krausmann (2013) described the measurement framework for economic resilience in an area impacted by disasters. Although it did not explain any specific methods for measuring resilience at the sector level, the study suggested the use of a computable equilibrium model to measure economic resilience in the macro-economic setting. However, the computable equilibrium model is relatively difficult to trace and analyze (Taylor & von Amin, 2006). Accordingly, they suggested that more studies are needed to explore other resilience assessments and measurements in the economic sector as it experiences disruptions. Furthermore, Righi et al. (2015) also argued that further research should be conducted on resilience measurement and assessment by implementing the Resilience Engineering (RE) platform in other field of studies. With this background, this study concludes that there is a research gap for exploration of a quantitative assessment of resilience in industrial sectors. Accordingly, this study proposes a method to analyze how the exchange rate shock changes sector resilience by examining any changes in production function described by the Cobb-Douglas Production Function (CDPF), such as production factors, labor, capital, and TFP values. This investigation is also intended to become a building block for the future design of a resilience-based indices measurement in different industrial setups. This study contributes to the development of measurement engineering that will be employed in a decision analysis with risk consideration. 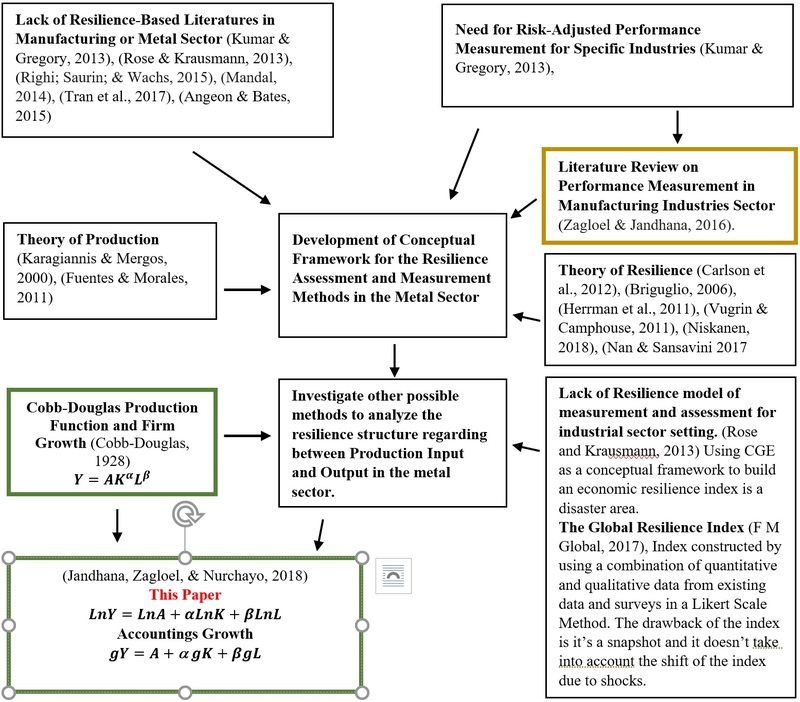 This paper includes several theories related to resilience studies and CDPF, the measurement methodology, the results of the calculation, a result discussion, and a conclusion. Resilience assessment helps decision makers analyze policies in the industrial sector and their associated risks. As discussed previously, this study proposes a method to analyze resilience in the metal sector in Indonesia by observing changes in production function. In this study, the Cobb-Douglas Production Function (CDPF) was employed to explore any variations in production factors, such as labor, capital, and TFP values, which were examined both before and after an economic crisis. By using the data series as the input of CDPF, the study shows that resilience in the Indonesian metal sector can be investigated and analyzed further. The result also shows that shock, represented by a change in exchange rate, impacts not only sector growth but also the composition of labor expense, capital investment, and TFP in the sector. This study found contradictory results in the analysis of the correlation between currency shock toward capital investment and sector output. This finding suggests that there is a need for further investigations on analyzing the impact of various shocks toward production function and developing its measurement method. In doing so, the result of this research will become a building block for future research in developing a resilience-based measurement for the industrial sector. The study also suggests that the sector’s resilience has improved as the industries are able to adapt to the new environment. Based on the findings, the drop in sector growth after the 2013 crisis was much shallower than the drop after the global crisis in 2008. Moreover, a positive trend in sector growth was seen after 2013. This study reflects an approximation of performance in the metal sector between 2005 and 2015, adjusted according to exchange rate shocks. This investigation did have some limitations, for example, labor expenses, capital investments, TFP, and exchange rate shocks were the only factors used to determine sector output. In reality, other factors also contribute to sector performance and the causes of shock that impact the sector. Nevertheless, the research findings are applicable to further studies of resilience capacity in other sectors. Briguglio, L., Cordina, G., Bugeja, S., Farrugia, N., 2006. Conceptualizing and Measuring Economic Resilience. Available online at www.researchgate.net, Accessed on May, 2016. Jandhana, I.B.M.P., Zagloel, T.Y.M., Nurcahyo, R., 2017. Measuring Industrial Resiliency by using Data Envelopment Analysis Approach. In: 3rd International Conference on Business and Engineering Research (ICBER). Osaka, Japan 17th-18th November.